Defence Minister Shri Manohar Parrikar inaugurated the 11th biennial edition of International Aerospace and Defence Exhibition and declared the Aero India 2017 open today at Air Force Station, Yelahanka in Bengaluru. This edition of Aero India, for the first time, combines the defence and civil aviation segments into a holistic event with the co involvement of the defence and civil aviation ministries in the event. During his inaugural address Shri Parrikar said that this edition of Aero India would witness the emerging dynamism of defence manufacturing in India, especially the rising role of Indian defence industry. He further stated that the government is committed to creating an enabling environment for a domestic ecosystem of defence manufacturing, the results of which were already visible. He added, “The defence public sector undertakings are being revitalized and encouraged. Government has also taken several initiatives for ease of doing business for private firms and additional initiatives are underway to support the role of private sector in defence manufacturing”. Minister for Civil Aviation, Shri P Ashok Gajapathi Raju speaking at the occasion highlighted that India was the fastest growing aviation sector in passenger terms in the world and held tremendous potential to graduate from the present position of being ninth in the world to being the third largest by 2022. The inaugural address was followed by three Mi-17 helicopters flying past the dais in formation carrying the Indian, the Air Force and the Aero India flags. This edition of Aero India has to its credit the first ever public display of Light Utility Helicopter LUH and the handing over by DRDO of the first indigenous Airborne Early Warning and Control System (AEW&CS) aircraft, the Embraer ERJ-145, in the Initial Operational Clearance configuration to the Indian Air Force. The Air Show witnessed a fly past by the Make in India formation consisting of HTT-40, Hawk-i, Dornier-228, Su-30MKI and the Tejas Light Combat Aircraft. This was followed by the fighters tearing through the skies displaying a host of aerobatic manoeuvres – the Su 30 MKI followed by Sweden’s SAAB Gripen, Tejas LCA, the American F-16 Falcon and the French Rafale. The Yakovlev aerobatic team, the Skycats, the Surya Kiran Aerobatics Team and the Sarang helicopter display team enthralled the spectators with their performance. Another unique feature of this air show was the 20-minute sortie by the Chief of the Air Staff, Air Chief Marshal Birender Singh Dhanoa, who flew in the Tejas LCA Trainer during the day. Present at the occasion were MoS Defence, Dr. Subhash Bhamre, Minister of State for Civil Aviation, Shri Jayant Sinha, the three service chiefs of the Army, Navy and the Air Force, and Industry Minister, Government of Karnataka, Shri RV Deshpande, Secretary Defence Production, delegates from several foreign countries, senior serving officers from the three Services, veterans, and senior executives from defence industries were also present. 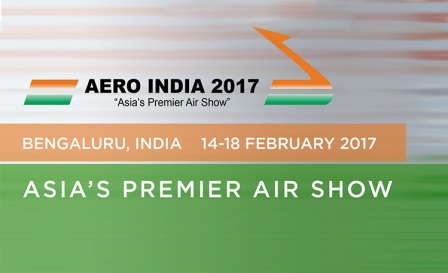 This edition of Aero India sees the participation of 549 companies with 53 Aircraft gracing the event. The total area of the show has grown from 24,403 sqm to 27,678 sqm this year. The gross area has also increased from 2,50,000 sqm to 2,60,000 sqm.